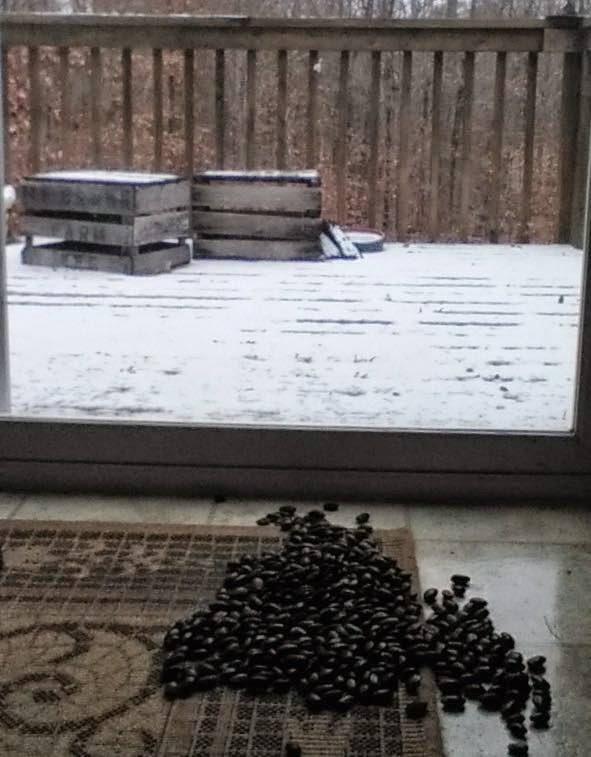 Beans on the kitchen floor overlooking a snow-dusted deck. Gordon returned with souvenir seeds. Monticello packages heirloom seeds from their gardens for sale. He chose Scarlet Runner Beans or Phaseolus coccineus. We planted. They grew. Vines rose and curled their way around our mailbox pole. Delicate red blossoms hung like dainty dance slippers. We admired. But soon we forgot about seeds, plants, blooms all, and lived and worked our way through a few more years, more Maine winters. Yet, a seed of an idea lay dormant. Then one day an overload of snow and ice spoke to us. It said: MOVE. We narrowed down areas: South. Virginia. Charlottesville. Our choice, like a dormant seed waking up, seemed part governed by reason – or nature, part by chance. We have been living less than 20 miles from Monticello for five years now. We live amid grazing deer, so we surrounded our garden with a 12-foot chain-link fence. The metal clashes with its woodsy setting, but keeps deer out. To dress up its industrial ugliness, I planted Scarlet Runner Beans along the protected side of the fence. In summer red blossoms drape its top, casually flowing in the lazy Southern heat. Hummingbirds dip into flowers' throats seeking nectar. This fall I collected an abundance of pods. Too many for me to replant. They will keep for some time, but as with most seeds – ideas included – the longer they stay dormant, the less chance they have of growing to fruition someday. Nevertheless, I shared my wealth of beans, giving them away so others might sow seeds – or leave them dormant to unexpectedly turn up – as we did-- in distant climes, other times. That's a beautiful area of Virginia. You're lucky! I look forward to seeing a photo of the red blossoms you talk about. I will plan on it for next summer. They are beautiful!